You’d think that over the course of fourteen seasons, the Winchester boys would have seen it all, angels, demons, ghosts, vampires, you name it-they’ve fought it, but they keep coming back for more. Eric Kripke’s superb show has an endearing quality, which we just cannot get enough of it and it can rightly take its place next to other legendary chillers such as The X Files and Twilight Zone. 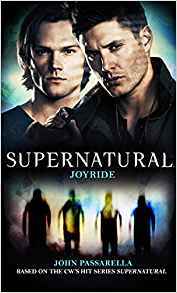 If per chance the shows are not enough for you and you need your fill of those good looking Winchester brothers, then Titan Books have got your back, with an all new adventure. Set during season twelve Joyride, sees the boys stumble upon a small town in Missouri, where at the stroke of midnight, anyone awake in the town inexplicably falls unconscious. An epidemic or something more sinister? When a wave of unexplained violent behavior breaks out with the perpetrators seemingly having no knowledge of their actions, it’s down to Sam and Dean to do what they do best. What secrets does this town hold and what can our favorite brothers do to stop it?